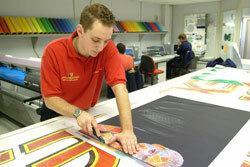 As the UK and Ireland's leading signs and graphics company, Signs Express has developed into a first class business and franchise network. The Signs Express franchise model was developed to provide a full professional service to a vast marketplace of potential customers in the business-to-business sector, and through massive growth year-on-year in the signage industry, potential is endless. 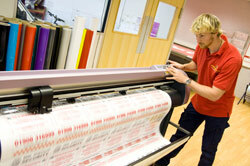 More and more businesses are realising the importance of creating the right first impression. Opening in 1989, the franchise network quickly flourished throughout the UK and soon after launched in Ireland. 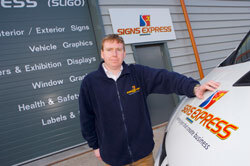 Now with franchises in Derry and Belfast in the North and Dublin, Bray and Sligo in the South and Signs Express is keen to expand its presence further in Ireland with new franchisees required in key areas like Kilkenny, Wexford, Waterford and Cork. It is important that all candidates are in the best financial situation and able to protect their own interests and financial commitments when applying to become a Signs Express franchisee. At least one third of the total capital requirement is needed, with the rest funded through bank finance. The full investment amount includes all set up costs and working capital for the first year, therefore alleviating the concerns which would normally be involved when starting a stand alone business. The investment breakdown helps make the process much easier by covering everything from the premises, equipment, furniture and transport through to the business package and franchise licence itself. The Signs Express franchise programme is considered by many to be second to none, covering all aspects of the franchise model to help new franchisees acquire the skills needed to open their production centre doors with confidence. Signs Express gives a four-week residential training course at its custom-designed training facility in Norwich, where the franchisee will meet the support team and other franchisees. Here they will also be shown technical and production techniques to help understand exactly what their staff will do. The programme also provides training in accounts, business development, human resources, IT, operations, marketing, technical, and national accounts management; as well as any further assistance in locating premises, centre set-up and fit-out, marketing materials, and staff recruitment. Starting from the first day of training, the franchisee is advised and supported by a team of experts dedicated to helping establish and grow the business. As well as getting help and advice in setting up the business, the franchisee receives a wealth of ongoing support from the Signs Express team at head office who combine an invaluable mix of industry experience. The team of support staff are always on hand to answer queries and provide advice for any problem encountered. The support team manages technical and operational queries, sales and marketing, national accounts and negotiates supplier relationships on behalf of the group. While the Signs Express network is growing there are still many opportunities to buy a franchise across the UK and Republic of Ireland. There are two main options when looking to buy a franchise. Firstly, there are a number of territories for sale in a 'greenfield' area, these are in effect start-up business opportunities; or secondly, a 'resale' area for those looking to buy an established business which is currently on the market. By choosing one of the new available territories there is the opportunity to tap into an area which is currently without the services of such an established signage specialist; approach the new business with fresh ideas and watch the business grow through an area which is rife with potential business-to-business customers. Or by buying an existing territory through the resale programme the franchisee could benefit from an existing customer base, existing staff and local awareness. Some franchisees are very specific where they want their business to be, however, if the chosen area has already been allocated, there may be a neighbouring territory still vacant.